Safely burn yard debris, cardboard, and confidential documents. 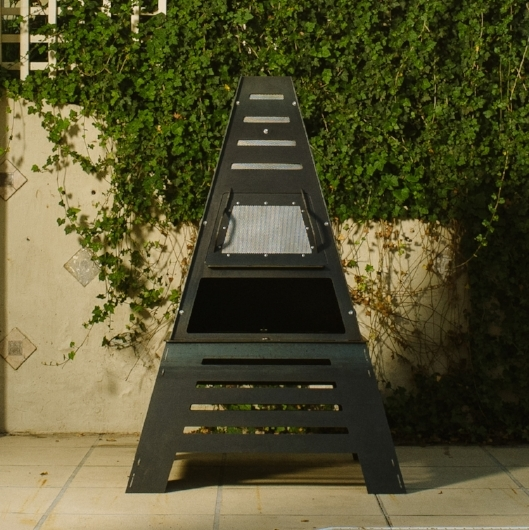 The Pyro Tower is a heavy duty metal chiminea precision cut from heavy duty 3/16” American Steel - over 3 times thicker than cheap import alternatives and is impervious to wind, hail, and yard debris. It’s designed to last a lifetime in the outdoors, aging naturally through the years in the beaufiful fashion that only steel can. Exceptional build quality creates a brag-worthy centerpiece to your favorite outdoor space. This metal chiminea is no one-trick pony, either. It boasts a full stable of accessories for cooking your favorite meals with charcoal or wood. Anything you can cook, you can cook better on a Pyro Tower. The Pyro Tower is the most flexible metal chiminea or outdoor cooker available combining the best features of a charcoal grill, wood smoker, and wood-fired oven all in one space-saving piece. We have individual kits available for your favorite styles of cooking, or you can get it all in our easy-to-order Complete Kit. The Pyro Tower is the only metal chiminea made from American Steel that includes a lifetime warranty and a full line of cooking accessories and add-ons. A metal chiminea will not crack or break the way a traditional clay chiminea might. It stores and radiates the heat from fire more efficiently than an open fire pit. The chimney effect of the Pyro Tower will also draw smoke up and away from guests seated around the fire. There are no second chances with an open flame - the Pyro Tower offers a higher level of safety for everyone by enclosing the fire while burning. While you can still be burned by the hot steel, it will protect from singed hair or clothing catching on fire. Flavor is back, baby! Nothing beats the taste of food cooked over a bed of charcoal or the magic of meat cooked over a wood fire. Check out our favorite recipes for cooking on the Pyro Tower. Join the revolution and fight the evolution of food and #feedyourcaveman. The debate burns on: How do you make the best-tasting burger? Depending on who you ask, the answers will vary. My advice: Cut no corners. Our products are painstakingly designed by craftsmen in Kansas with the simple goal of helping you enjoy your backyard or favorite space to the fullest extent possible. We believe in building each product with longevity in mind. We select the highest quality domestic steel and build each item so that it can be easily maintained by their owners for years to come. You will find no throw-away products here - everything is built to last a generation.